Celebrated for its incredible horsepower and classic, retro vibes, the Dodge Challenger is one of the most iconic muscle cars on the market. In 2018, the Challenger continues its tradition of heritage styling and drag-strip-worthy speed, while keeping up with the latest engineering innovations and tech features to remain on the cutting-edge within its segment. With an impressive powertrain lineup and seven major trim levels (many with subtrims), the 2018 Dodge Challenger is versatile and highly customizable, and there's sure to be a Challenger for everyone within the lineup. The heart of every muscle car is a powerful engine, and the 2018 Challenger is no exception. 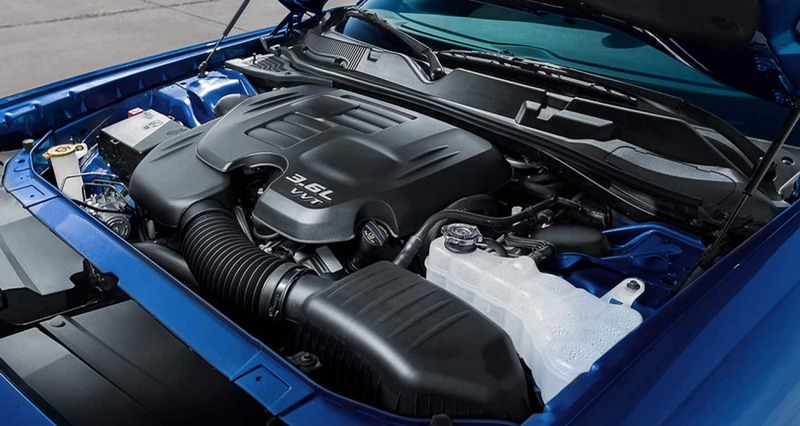 A number of capable engines power different trims and special editions of the 2018 Challenger, starting with the base 305 horsepower 3.6-liter Pentastar V6. This base engine offers considerable power and puts out 268 lb-ft of torque, and thigs only get better from there. Among other available Challenger engines are the R/T's 5.7-liter V8 and the larger 6.4-liter V8 utilized by the R/T 392 and the SRT 392. The SRT Hellcat is powered by a supercharged 6.2-liter V8, which puts out 707 horsepower and 650 lb-ft of torque, which may seem like more than enough power, but the chart-topping SRT Demon takes speed to the next level. An 840 horsepower 6.2-liter HEMI V8 launches the Challenger SRT Demon into its status as the most powerful muscle car in history. With the world's fastest quarter-mile speed (9.65 seconds) of any production car, as well as the world's fastest production car zero-to-sixty acceleration (2.3 seconds), it's no wonder that the 2018 Challenger SRT Demon is the standout among the Challenger lineup. What's so great about the Dodge Challenger's interior? Across the board, Challengers have been praised for their interior comfort and utility. With an incredible 16.2 cubic feet of trunk space and available folding rear seats, the Challenger can pack an impressive amount of gear, and lets you take on adventures in style. Rear seat space, as well, is notable among similar muscular coupes. With three rear seats as opposed to most competitors' two, as well as ample leg and shoulder room, passengers will ride in comfort as they experience the sporty excitement of a classic muscle car. Sport-tuned suspension and noise cancellation keep the Challenger's interior quiet and comfortable, even as the formidable engine roars beneath the hood. Available premium leather upholstery give the interior a feeling of luxury, and pops in available Demonic Red. A standard 7-inch touchscreen is enabled with Uconnect technology, with Apple CarPlay and Android Auto available on many trims for smartphone integration. What's the difference between the 2018 Challenger's trim levels and special editions? With seven available trims and multiple subtrims, as well as the additional SRT Hellcat, SRT Hellcat Widebody and the SRT Demon, the possibilities for customizing your 2018 Challenger are endless. 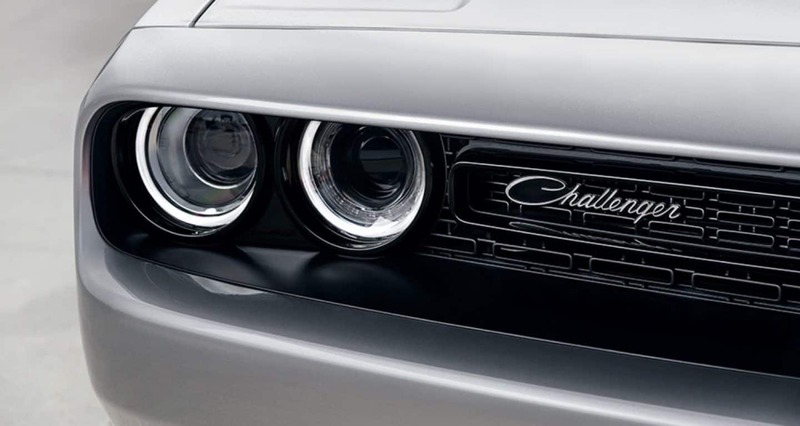 Aside from engine differences, the Challenger's trims come with differing levels of comfort and convenience features, different drivetrain options, and varying interior and exterior designs. 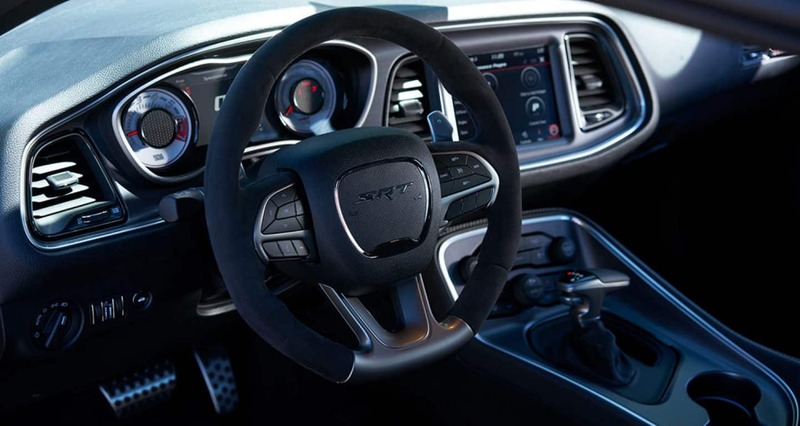 For example, the base SXT and the GT are only available with an eight-speed automatic transmission, and include interior features such as automatic headlights, keyless ignition, Bluetooth connectivity, a rearview camera, dual-zone automatic climate control and more. The GT is also the only Challenger (and, in fact, the only muscle coupe on the market) to be equipped with all-wheel drive. Moving through the R/T, R/T 392 and SRT 392, additional features such as Brembo performance brakes, an available manual transmission, a larger touchscreen interface, leather seats, and an 18-speaker Harman Kardon audio system are available, among others. SRT Hellcat and Demon models include many of the amenities available on other top trims, as well as unique design features such as quad exhaust tips, interior and exterior badging, and automatic high beams and wipers. Celebrated for its classic stylings, comfortable and spacious interior, and indisputable engine power, the Dodge Challenger delivers on all fronts. For those seeking incredible muscle car speed that doesn't sacrifice drivability or comfort, the 2018 Challenger is the way to go.